The Trek Bicycle Corporation has issued a recall in Canada and the United States for the 2012 FX series of bicycles. The models are 7.2 FX, 7.3 FX, 7.4 FX and 7.5 FX. 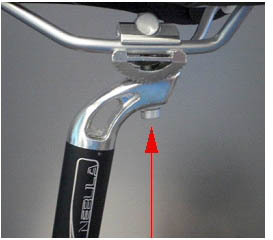 The recall is over the bolt that secures the seat saddle clamp to the seat post, which can break, causing a fall hazard. No reports of injuries or incidents in Canada have been received, however, Trek received four reports in the U.S, with one incident involving a broken tooth and lip injury. Approximately 1,136 recalled bicycles were sold in Canada, and 27,000 in the U.S. at specialty bicycle retailers. The recalled models were sold between May 2011 and September 2011. 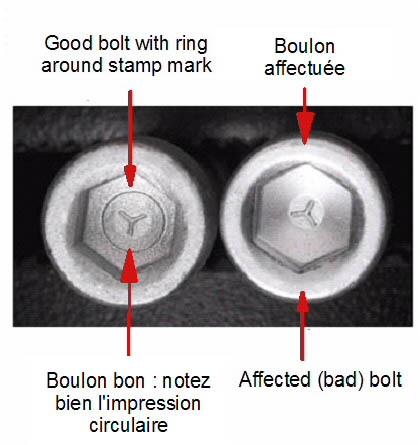 Images showing the location on the bike of the affected bolt, and the markings differentiating a defective and non-defective bolt are below.